The Prelude, commissioned by Shell, will be used as a liquefied natural gas platform. Yesterday, a true behemoth floated out of the drydock at Samsung’s Heavy Industries’ shipyard in Geoje, South Korea. The 488-meter long Prelude, touted as the world’s largest ship, would be higher than Kuala Lumpur’s Petronas Twin Towers if stood up from stern to bow. However, this record-breaking “ship” is technically not a ship at all. 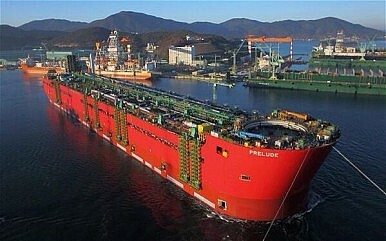 Commissioned by Dutch energy giant Shell, the Prelude will be used as a floating liquefied natural gas (LNG) platform. Because it is unable to move under its own power – it must be towed from destination to destination – it is more accurate to refer to the Prelude as the world’s largest floating facility. Regardless of what you call it, the Prelude boasts some impressive specifications. Upon completion in 2017, it will measure 74 meters wide and 110 meters high – wider than two full-grown blue whales and taller than the Statue of Liberty. Once fully-loaded with equipment, the Prelude will weigh more than 600,000 tons, “displacing the same amount of water as six of the world’s largest aircraft carriers” according to AFP. Shell will tow the completed Prelude to an area about 475 kilometers off the coast of Western Australia. Once anchored, the massive vessel will extract natural gas from deep beneath the ocean floor. The Prelude will then chill the gas into a liquid form which will allow it to be stored and shipped more easily. Considering this year’s highly active typhoon season, the prospect of a giant floating island pumping highly flammable fossil fuels sounds like a disaster waiting to happen. But Shell engineers, who expect the Prelude to be used for 20 to 25 years, have equipped it with defenses. Similar to oil rigs in the Gulf of Mexico, the Prelude will have an onboard crew of about 100 workers who will maintain operations during two-week shifts. It may also provide a boom to the Australian economy. The country is expected to more than double its gas production by 2020. “Eliminating pipelines and other onshore costs, floating LNG production may prove the blessing Australia needs to stay in the gas game,” said The Economist. Although Samsung Heavy Industries pegged the vessel’s cost at approximately $3 billion back in 2011, Businessweek reported that it could end up costing more than $10 billion. Shell has declined to comment.